Sources: ♦ In 2013 the U.S. Department of Justice, Southern District of New York, announced an indictment against a Russian Operative Evgeny Buryakov. LINK HERE In March of 2016 Buryakov pleaded GUILTY. NEW YORK (Reuters) – The FBI eavesdropped on meetings involving Russian intelligence personnel in New York City, including a suspected spy posing as a trade representative, by hiding recorders in binders containing supposedly confidential information about the energy sector, U.S. prosecutors said. The hours of covert recordings from 2013 were disclosed in papers filed in Manhattan federal court on Tuesday in the case of Evgeny Buryakov, a Russian citizen who U.S. prosecutors say posed as a banker while participating in a Cold War-style spy ring. […] According to prosecutors, in April 2012, Sporyshev met an undercover FBI employee posing as an analyst at a New York energy firm at an oil and gas industry conference. Russian intelligence operatives tried in 2013 to recruit an American businessman and eventual foreign policy adviser to the Trump campaign who is now part of the F.B.I. investigation into Russia’s interference into the American election, according to federal court documents and a statement issued by the businessman. The businessman, Carter Page, met with one of three Russians who were eventually charged with being undeclared officers with Russia’s foreign intelligence service, known as the S.V.R. The F.B.I. interviewed Mr. Page in 2013 as part of an investigation into the spy ring, but decided that he had not known the man was a spy, and the bureau never accused Mr. Page of wrongdoing. “The FBI obtained the recordings after Sporyshev attempted to recruit an FBI undercover employee (“UCE-1”), who was posing as an analyst from a New York-based energy company”. “Male-1” is described as “working as a consultant in New York City”. The information on “Male-1” corresponds with news reports of Page’s role in this case. A great deal was made in the press of a defendant calling him an “idiot”, his frequent trips to Moscow, that he was “hooked on Gazprom” (the Russian natural gas company) and that it was “obvious he wants to earn lots of money”. 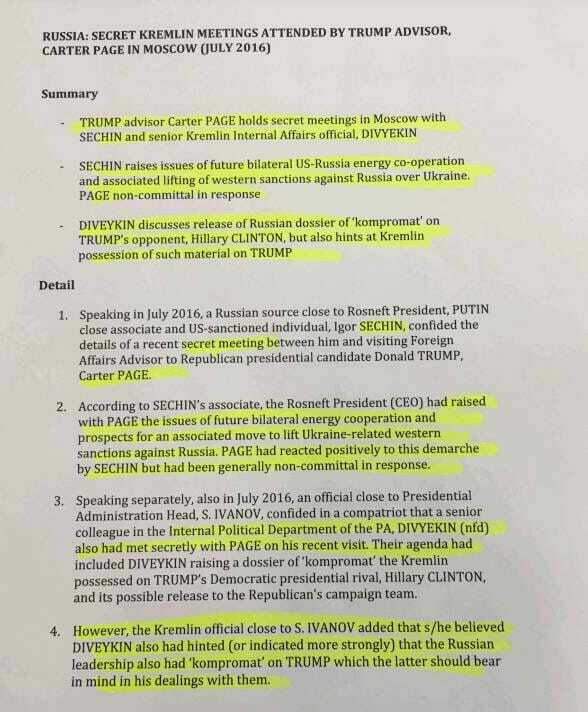 This is the same language that was used to describe Carter Page in the now debunked Russia dossier. It sounds like the same person. It is transparently clear that Carter Page was the Under-Cover Employee (UCE) of the FBI in the 2013 case. Carter Page was working for the FBI. 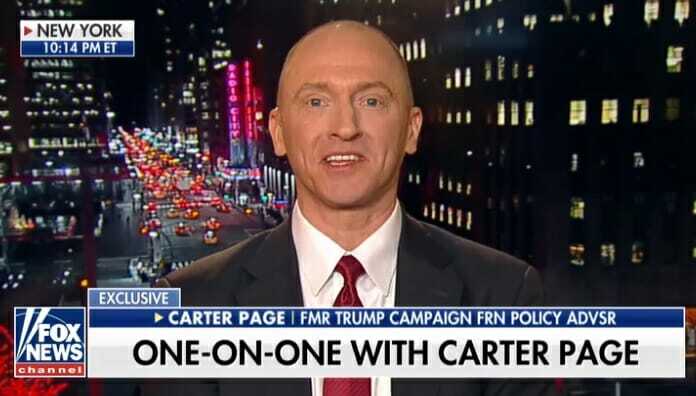 The question is: Was Carter Page planted inside the Trump campaign to allow the FBI to spy on Trump?